I’m up and raring to go today, my last full day for this trip. The forecast is good and I’ve deliberately saved this walk for today because of it. 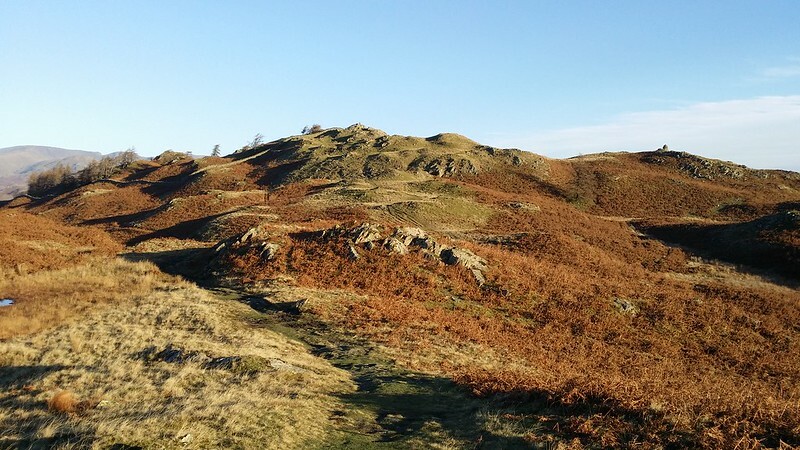 The bus whisks me out to Hawkshead Hill and I jump out at High Cross – strategically chosen because it’s the nearest point to my target on a bus route that also avoids me treading the same ground twice. It also has an extra benefit in terms of reducing the amount of ascent I have to do, and I’m happy to accept this free gift. 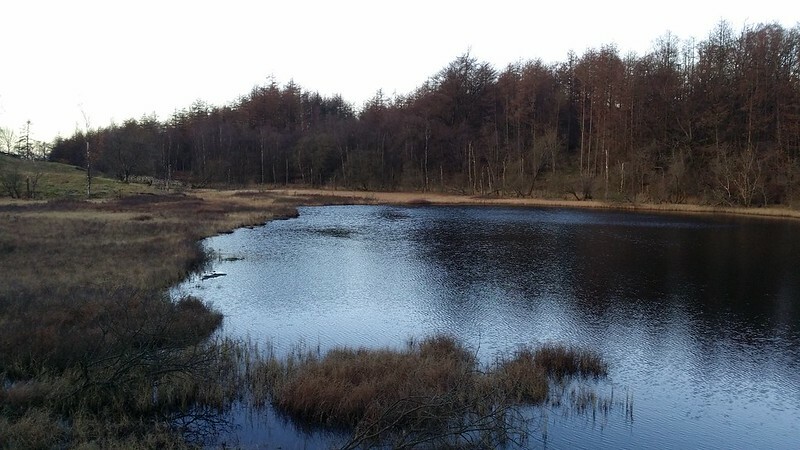 I hop across the road into a field and make for my first target: Wharton Tarn. Dark reflections of the surrounding trees in its still waters, thick undergrowth crowding its shores. I get the sense this place isn’t visited as much as its proximity to the road and a car park would usually warrant. 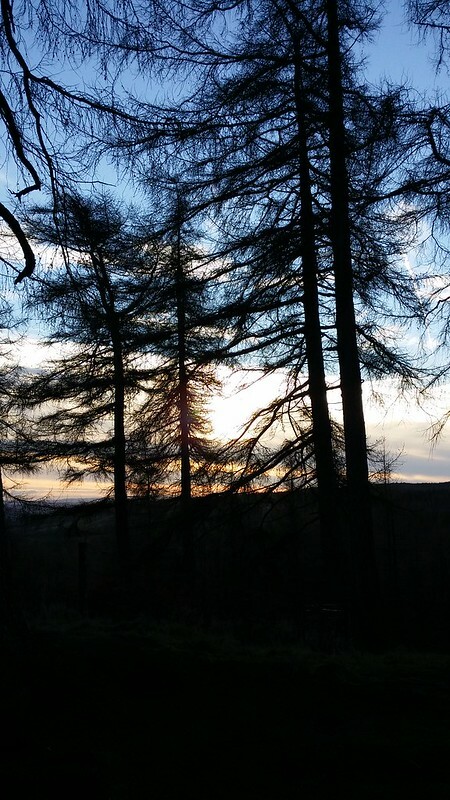 The early morning sun is still finishing off its startup phase as I now walk through trees, eerily lit from behind. 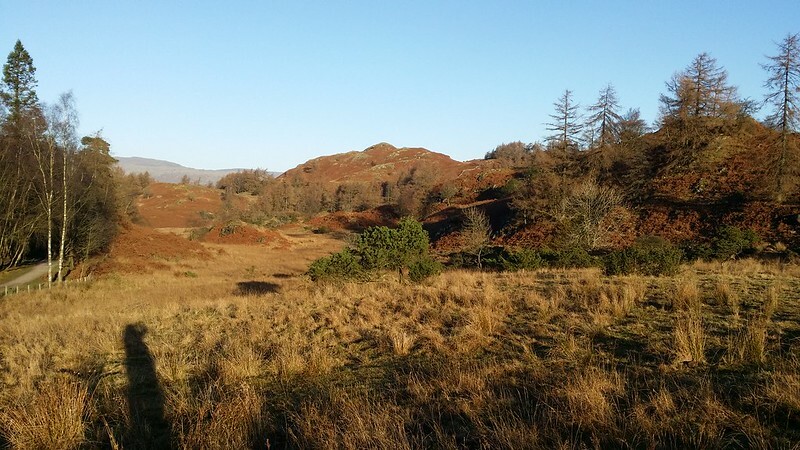 The higher fells are still coloured in dull shades but as I approach Tarn Hows, shadows are beginning to creep over their nooks and crannies. Tarn Hows is big and much time is spent taking in the scene on this, my first visit. 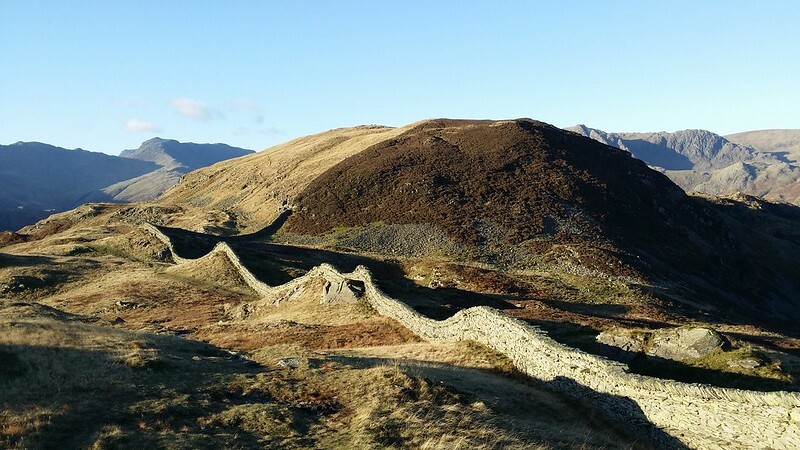 My Cumbria Way route bypassed this place due to my intention to pick off 3 nearby fells on the way – only the first of which actually got done on a really hard day. The remaining two have waited another 3½ years – so it’s time to deal with them today. 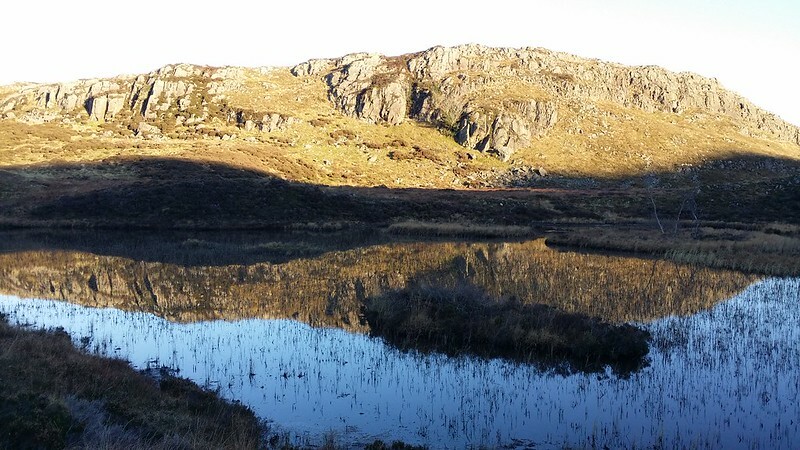 I tear myself away from the extensive tarn and head for my next objective – Rose Castle Tarn. This is tucked away just off a side path in a small wood. Clearly this seems even less popular than Wharton Tarn. 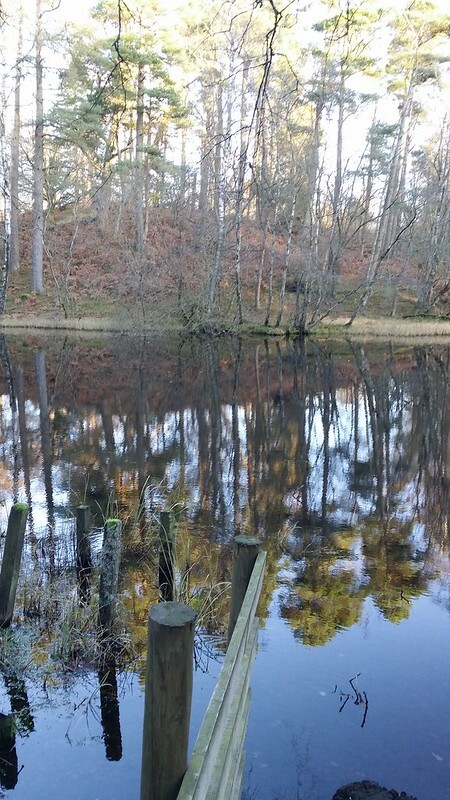 It’s basically just a big pond in a wood, but it has some nice reflections. Back on the main set of paths, which I’d planned to follow in a sequence of zig zags to get me to the start of the climb onto Black Fell, I see a small trodden route to a stile and take that instead. This winds me around Torver Intake and puts me at the bottom of Iron Keld Plantation, so saving me some walking. I head up through the plantation, sounds of forestry operations seemingly close but never actually seen. A bunch of cows linger next to the path and seem surprised to see me. I’m through the plantation and another decision is needed – to continue on paths or strike out directly towards the summit. I choose the latter because there is an obvious route that others have taken. Exactly how to get to the top is something that has puzzled me, and possibly had some influence in the time it has taken to get around to climbing this fell. The colours of the day are now developing and I walk through a landscape of rich browns and yellowy faded greens. 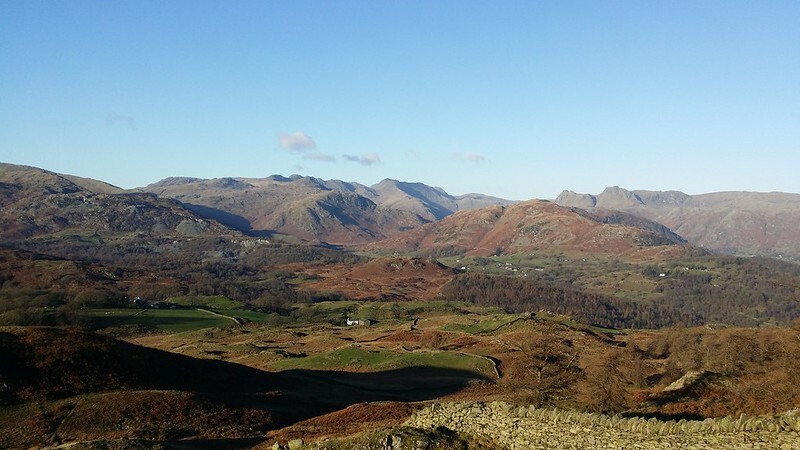 Blue has crept into the sky and outlined the tops of the fells more clearly. 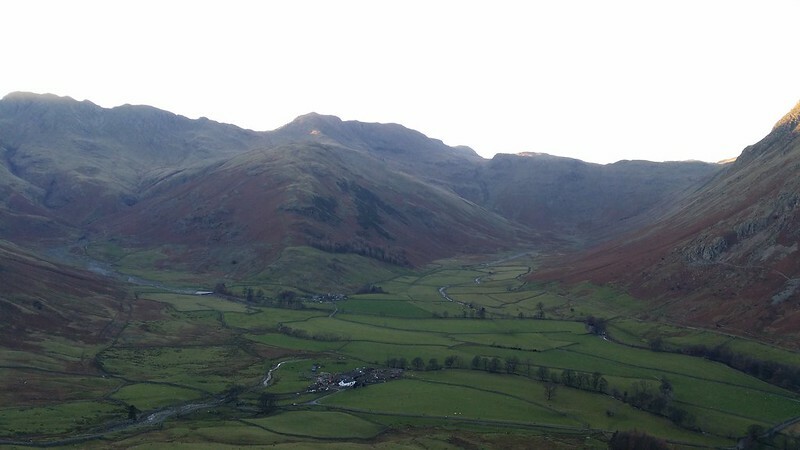 More fells come into clear view as I gain height. This is why I saved this walk for today, and the decision is proving to be a good one. Ahead of me I see something sticking up from an outcrop and realise it’s the trig point. I’m nearly at the summit, and it’s not really been that strenuous a walk. 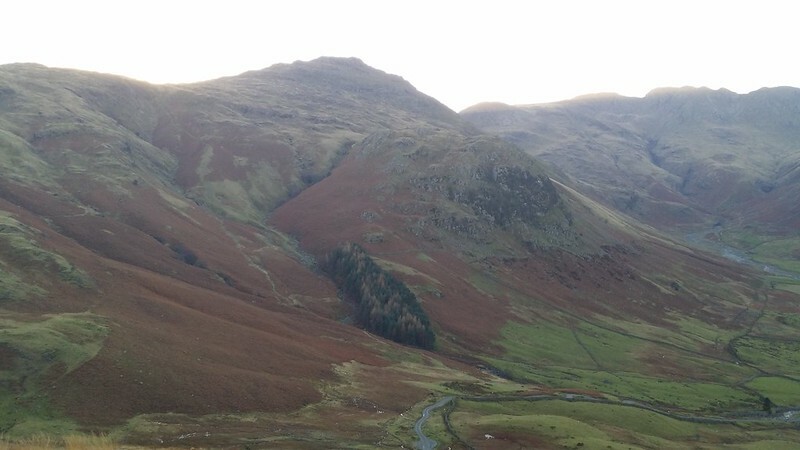 Spirits are high as I clamber up to the top to bag the fell and look at the views. Unfortunately, the main views are in the direction the biting wind is coming from, so a form of compromise between views and shelter is reached. In any case, I’ll be walking towards those views in the next part of the walk. The descent is directly down westwards until I hit the main path. I realise that in front of me is a view that Stuart let me pinch the photo of for a prospective painting, which I never quite got around to. But the conditions are brighter today than on his walk, so I take some additional reference photos, and promise to get the work done. I descend to Colwith Brow and have a debate with myself as to the course to take – paths for interest or road for speed. 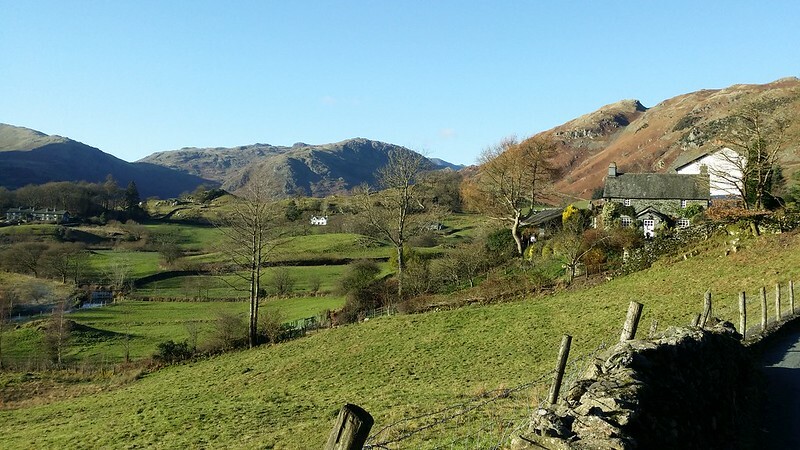 Concerned about finishing the walk in daylight and also wanting to make sure I catch my bus, I opt for the straightforwardness of the road into Little Langdale, before taking to paths again at Wilson Place. 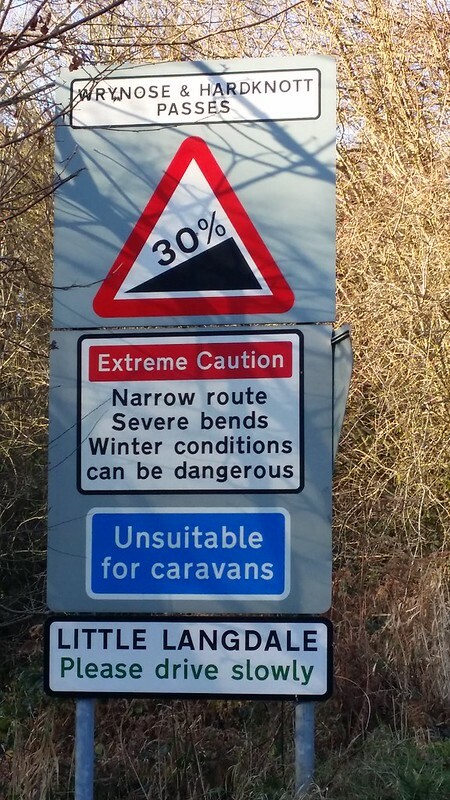 Some contradictory signage is resolved by simply heading in the common sense direction, and I arrive at the base of Lingmoor Fell. The narrow path zig zags steeply up towards the crest of the ridge, and as I gain the top the wind bites harder. 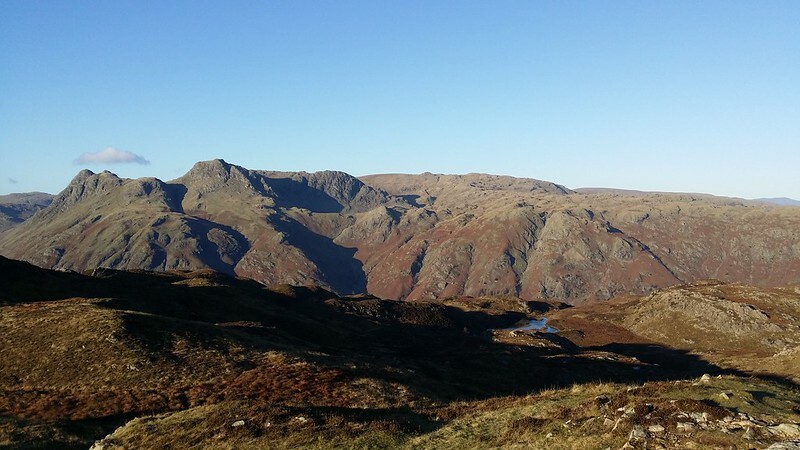 Progress becomes slower as I walk into the wind, but also due to the views of the Langdales that are developing as I progress along the fell. 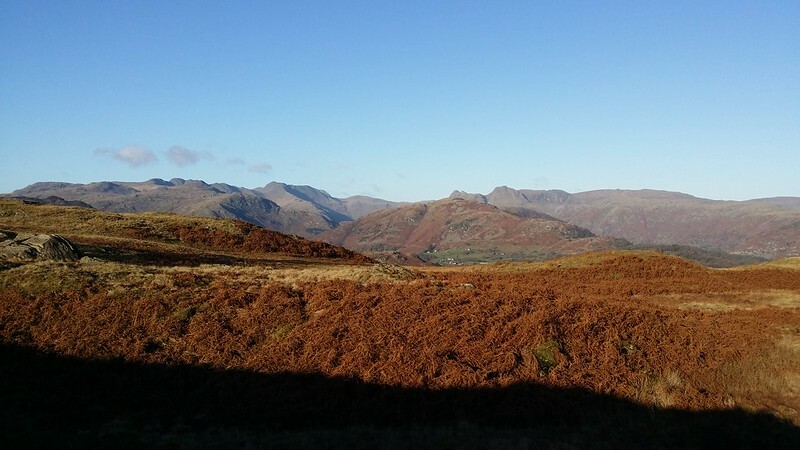 Various undulations come and go – Lingmoor Fell is one of those that seems to go on forever, and it takes a while for the eventual top to become obvious. The wall acts as a good handrail though, so the final outcome is never in doubt. I cross over and clamber up to the summit outcrop. 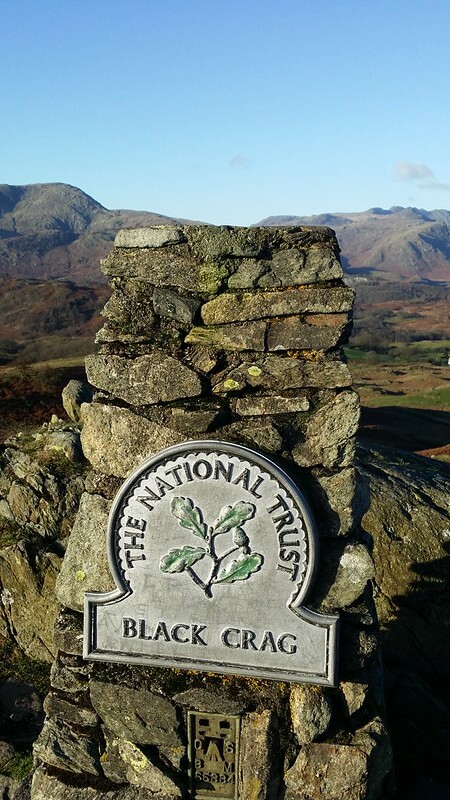 At a stroke, my plans for my final Wainwright are back up in the air, Lingmoor Fell having for a while been intended as the last. Some of the magic that had previously pushed me to saving this one for last had dissipated over recent months, and brought my original one back into contention. 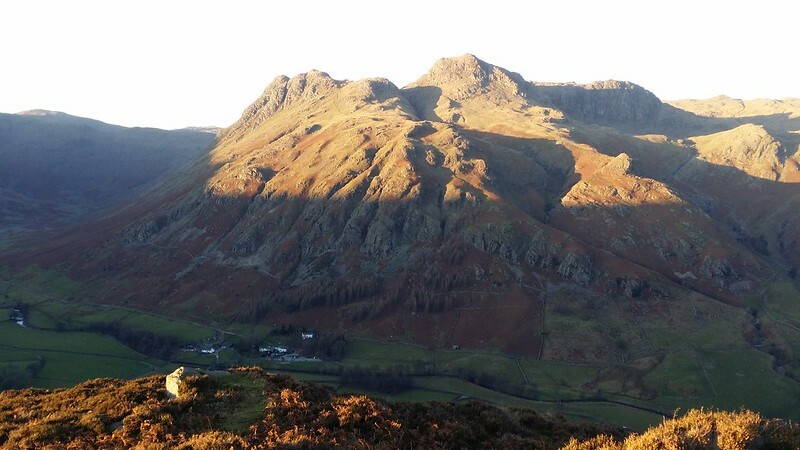 With Lingmoor now eliminated, Haystacks is back in pole position. 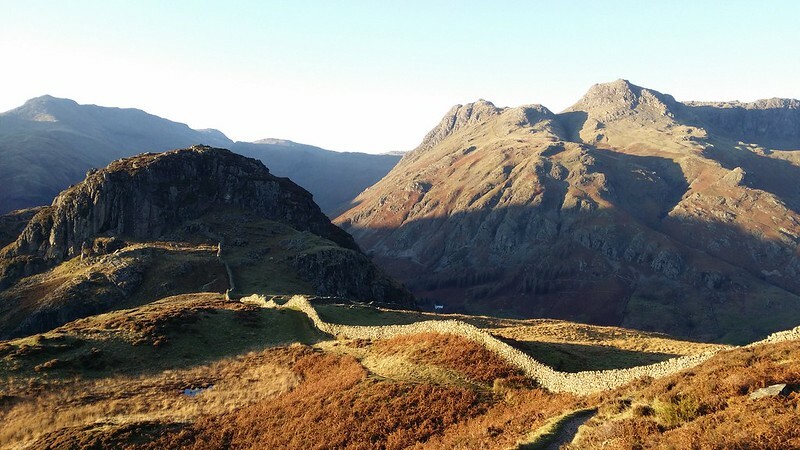 I don’t feel at all bad about this – I haven’t enjoyed the climb of Lingmoor Fell half as much as I’d expected, and I’m now glad it’s not going to be my last one. 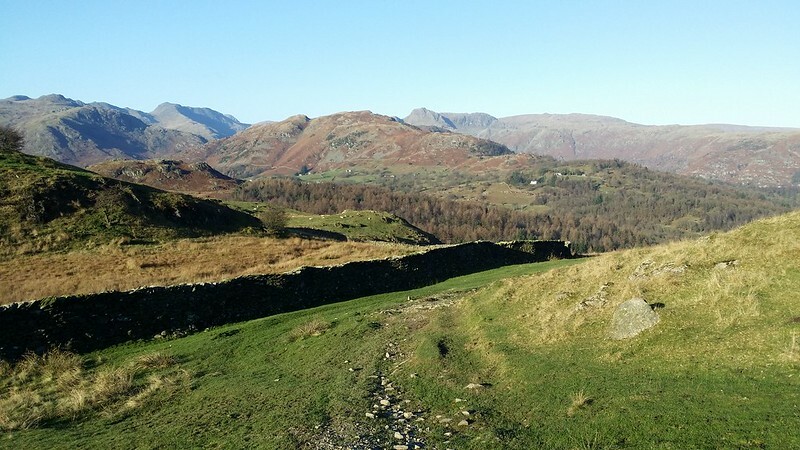 I follow the wall a little further and then spot an opportune way down to my next objective – Lingmoor Tarn, already seen from above on the final part of the climb. The descent is steep in places, wet in a few spots and brackeny throughout, but it takes very little time to reach the tarn. Again I’m underwhelmed – it’s nowhere near as good as I’d hoped. I spend very little time here and instead try to find the sheep track that will contour me back around to the main path. 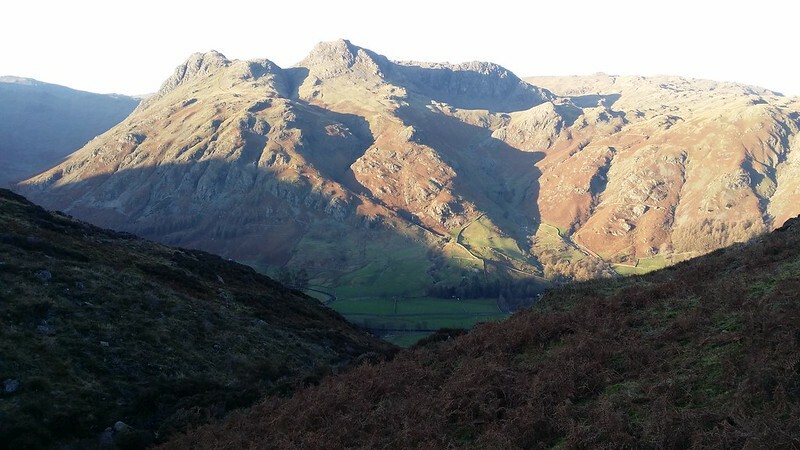 To my right, the lowering sun is causing deep shadows to play over the Langdale Pikes, a reminder of how short the days are at this time of year. 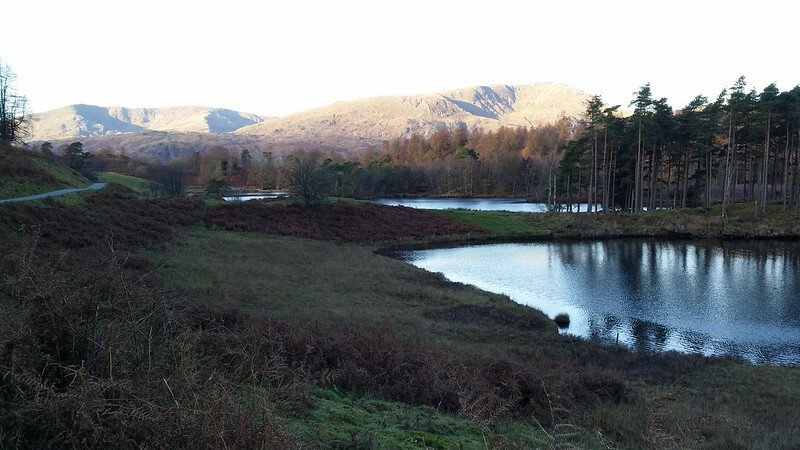 I decide not to bother with a half plan I had of stopping to paint from Blea Tarn – I’m not happy with the light. A far better plan is to use the time in the ODG. 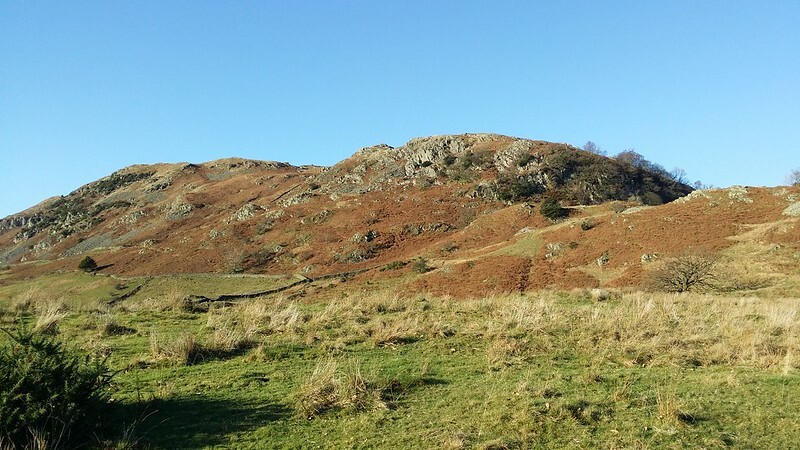 I rejoin the main path and head for the rocky hump in front of me, unsure of the way up – on the map the path just seems to stop and then resume after a short distance on the other side. 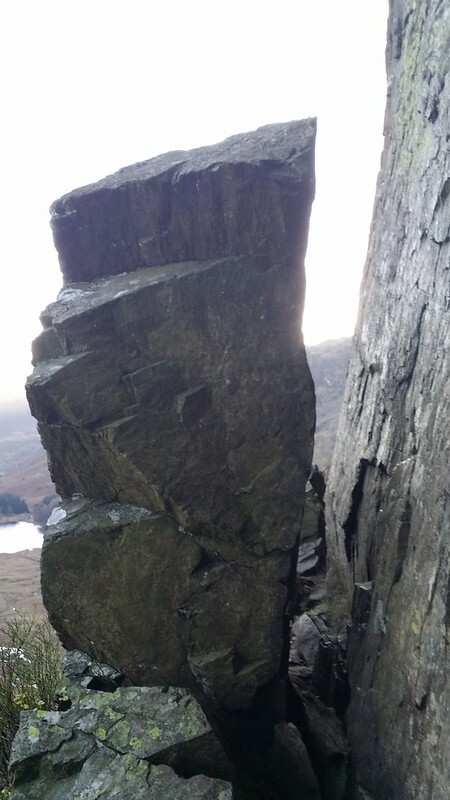 It becomes clear when I reach the foot of Side Pike though – a narrow path leads around to the left, and there I come to Fat Man’s Agony, a narrow gap between the rock face and a stone balanced above the valley below. It’s rucksack-off time, but before committing my gear to the other side of the fissure, I check I can squeeze through. I do. 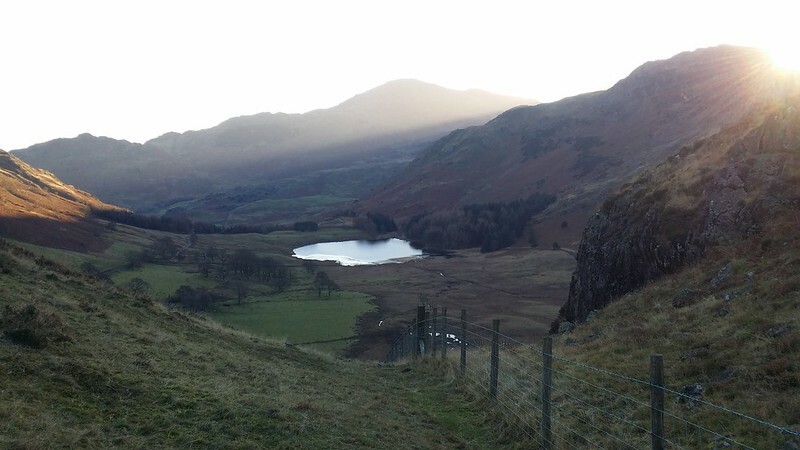 The path winds around to the other side of Side Pike and I climb up the remaining short distance to the top. My views of the Pikes are clearer now, but the sun is rapidly deteriorating the scene. I descend to the road and walk down to the ODG to kill some time before the bus. And I’m back in time to meet Gina and Dave for dinner in the Lily. Nice account and photos Matt. We have to take our packs off on the Side Pike rock fissure. What a lovely walk! I feel like I was alongside you.